My name is Jeremy Dean Russell, many of you that know me are aware that in July of 1996, I fell asleep on the way home driving a 1969 Jeep Commando. I over corrected and rolled corner to corner three times while being ejected on the second roll. The Jeep blew up and went upside down in the Colorado River. If it had not caught the riverbank on fire, I would not be here now. This split second in time would change my life forever. I have no recollection of the accident, but by God’s grace, a truck driver called in a brush fire and unknowingly saved my life. My first cognitive memory was 30 days later, I found myself in a wheelchair with tubes sticking out of me everywhere, I had lost 13 years of memory from a TBI, was told that I had bleed to death from massive internal injuries, had a broken pelvis, separated SI joint, punctured lung and the list goes on. My right leg badly damaged, nearly ripped from my body was put back together. I kept it for some time but later it became infected with MRSA, after 28 different debridements and almost going deaf from the antibiotics, the doctors removed it emergently to save my life. 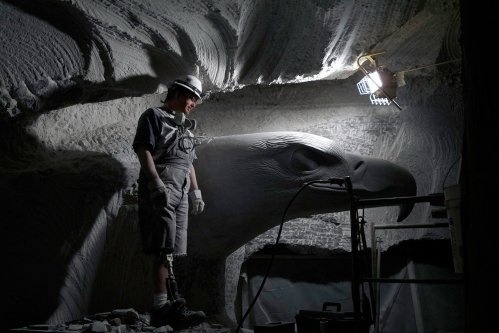 4 years later after years in the hospital and adapting to the aftermath, I was Introduced to an enormous wall of alabaster, I was given the opportunity to carve a fifty-foot eagle; I dubbed it “The Freedom Eagle”. I spent the next 18 years carving and fighting to finish this dream, but found myself spinning my wheels in a pool of red tape. I had to move on, leaving a part of my heart and soul inside that mountain. I moved to Grand Junction, CO, to be closer to family and to reinvent myself once again. I accepted a job at an amazing company called RDI as a CNC, plasma table operator. Bought a house in Orchard Mesa with my Wife Kelly and worked my tail off in the pursuit of the American Dream. It is at this time that I find myself in a wheelchair, haunted by the damage done in the accident. 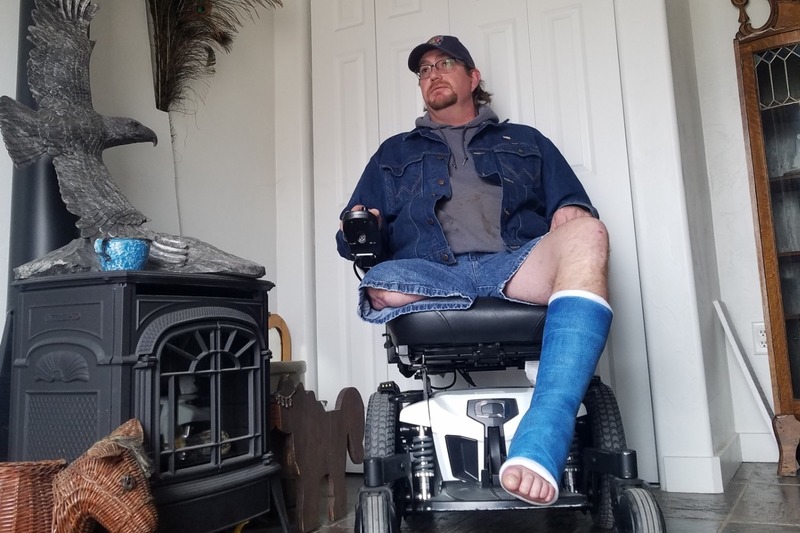 After years of fighting to get off of disability, my pride has caught up to me. My left Achilles tendon is blown up, and both of my shoulders are compromised. The doctors have casted the achilles in hopes it will heal on its own. If it does then I will be able to go ahead with the spinal surgery to repair the leads implanted next to my spinal cord. The implant allows me to shut down the extreme burning pain in my lower extremities. Needless to say it is non-functional at this time. I’m asking for your help to cover expenses during these next few months while I undergo the necessary medical treatment to improve quality of life, and help me to get back to work, My employer who has stuck in there with me would like me to train on a CAD program called SolidWorks and move me to a desk position. I have an extensive computer background and am excited to keep being a productive member of society. That being said, I would like to ask for help obtaining the CAD program SolidWorks as well. One license is $3,995. The Annual Subscription service, which covers technical support and upgrades for one year, is $1295. This article was posted in Medical.